Electronic commerce is emerging as a major application area for database systems. A large number of e-commerce sites provide electronic product catalogs that allow users to search products of interest. Due to the constant evolution and the high sparsity of e-commerce data, most commercial e-commerce systems use the so-called vertical schema for data storage. However, query processing for data stored using vertical schema is extremely slow because current RDBMS, especially its costbased query optimizer, is designed to deal with traditional horizontal schema efficiently. Most e-commerce systems would like to offer advanced parametric search capabilities to their users. However, most searches are expected to be online which means that the query execution should be very fast. RDBMSs require new capabilities and enhancements before they can satisfy the search performance criteria against vertical schema. The tightly-coupled enhancements and additions to a DBMS require considerable amount of work and may take a long time to be accomplished. 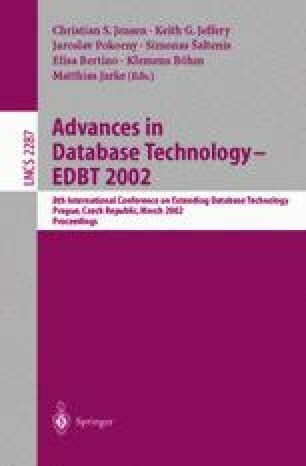 In this paper, we describe an alternative approach called SAL, a Search Assistant Layer that can be implemented outside a database engine to accommodate the urgent need for efficient parametric search on e-commerce data. Our experimental results show that dramatic performance improvement is provided by SAL for search queries.